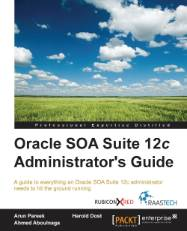 · SOA Suite 12c: Startup and Shutdown The complete 3rd chapter from Oracle SOA Suite 12c Administrator’s Guide (2015, Packt Publishing), written by Arun Pareek, Oracle ACE Ahmed Aboulnaga, and Oracle ACE Associate Harold Dost. Read the chapter. · Oracle API Management Implementation Case Study The entire 2nd chapter from Oracle API Management 12c Implementation (2015, Packt Publishing), written by Oracle ACE Director Luis Weir, Oracle ACE Rolando Carraso, Oracle ACE Arturo Viveros, and Andrew Bell. Read the chapter. · Adaptive Case Management The complete 9th chapter from Design Principles for Process-driven Architectures Using Oracle BPM and SOA Suite 12c (2015, Packt Publishing), written by Oracle ACE Directors Matjaz B. Juric, Danilo Schmeidel, Torsten Winterberg, Guido Schmutz, Hajo Normann, and Mark Simpson and Oracle ACE Sven Bernhardt. Read the chapter. · OTN Tech Summit Middleware Video Replays All six sessions from the middleware track in the Spring 2016 edition of the OTN Virtual Technology Summit are available for unlimited on-demand replay in the Replay Library. There are three sessions each covering the Internet of Things and WebLogic 12c/Java EE sub-tracks. Watch the videos.